The UK online population is no longer content to lurk in forums and on websites without contributing, with 77% of us now actively participating in digital media in some way. This, according to the BBC, signals the death of the 1% rule. For those unfamiliar with it, the 1% rule states that in any given online community only 1% will create content, 9% will edit or modify that content and the rest will consume the content without contributing. It is the web’s version of the Pareto principle, which is also known as the 80:20 rule. However new research by the BBC suggests that the 1% rule is now outdated. The Beeb surveyed 7,500 UK adults to find out how they participate in digital media “from sharing links, to writing blogs and uploading photos”. The results indicate that the number of people participating online is significantly higher than 10%, with the increase driven by the rise of “easy participation”. Activities which may have once required great effort but now are relatively easy, expected and every day. 60% of the UK online population now participates in this way, from sharing photos to starting a discussion. But despite participation becoming easier, almost a quarter of people (23%) remain passive and do not participate at all. 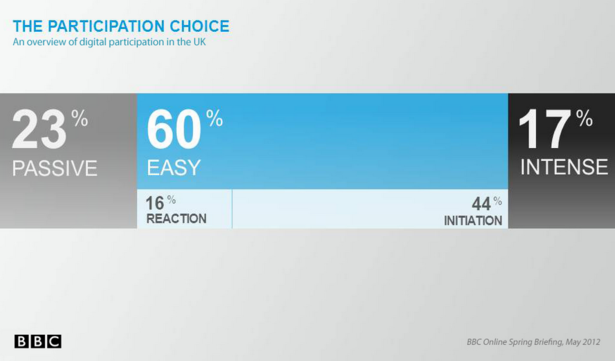 Interestingly, the level of participation is not necessarily dictated by digital literacy, as 11% of the passive group are also early adopters. Digital participation now is best characterised through the lens of choice. These are the decisions we take about whether, when, with whom and around what, we will participate. Because participation is now much more about who we are, than what we have, or our digital skill. But does this necessarily mean we need to rethink how we view online engagement? As GigaOm points out, the 1% rule does not refer to the number of people participating with content across the web as a whole, instead it refers to the number of users creating content within a particular online community. Social media plugins and apps mean it is easier than ever to share or post comments, so it’s no real surprise that 77% of us participate in some way. But this ignores the fact that we behave differently in different places. For example, I have friends who are extremely active on Facebook but only use Twitter to follow celebrities. So while the way we participate online will undoubtedly evolve over time, is the BBC right to claim that the 1% rule is dead? In my view it seems far-fetched to suggest that on any given blog you can expect more than three-quarters of users to participate.